Lt. Col. Siegfried Ullrich, G31, US Army Space and Missile Defense Command/Army Forces Strategic Command, right, provides an introduction to space operations during a two-day training session for Ukrainian officers. The US Army Space and Missile Defense Command provided special training to Ukrainian soldiers who have been dealing with the frustration of poor quality and disrupted space operations during their battle against Russian separatists in the Ukraine. At the request of US Army Europe, US Army Space and Missile Defense Command/Army Forces Strategic Command recently provided space operations training to Ukrainian soldiers here. Lt. Col. Siegfried Ullrich, 1st Sgt. Eldon Brown, Staff Sgt. Travis Andrews and Sgt. Kenneth Pehoski, all from SMDC, traveled to Ukraine to conduct the training for the Joint Multinational Training Group-Ukraine, which provides defensive and security training to the Ukrainian Ministry of Defense forces. The California National Guard, who has a partnership with the Ukraine, maintains headquarters responsibility for JMTG-U. The JMTG-U mission is to build professional and capable Ukrainian units to defend Ukraine's sovereignty and territorial integrity. There are currently cadre on the ground from the 3rd Battalion, 15th Infantry Regiment, 2nd Infantry Brigade Combat Team, 3rd Infantry Division out of Fort Stewart, Georgia, the Joint Multinational Training Center from Grafenwoehr, Germany, as well as teams from Canada and Lithuania. "The California National Guard Soldiers work and train with these Ukrainian soldiers," Ullrich said. "It's basically like an international training center. They have rotating units that come through. "The California National Guard told us they were experiencing a lot of denied, degraded and disrupted space operations in their conflict with Russian separatists in the Ukraine," said Ullrich. "So they asked for some specialized space training from SMDC to help them mitigate some of these things." 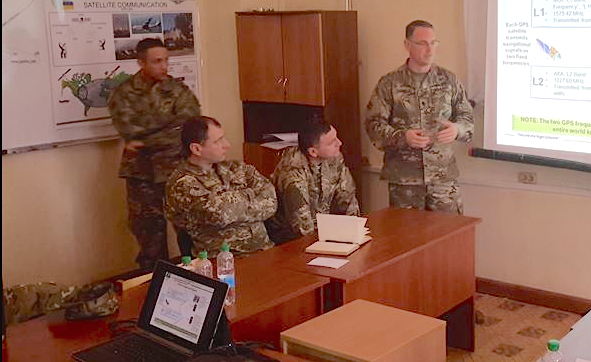 The SMDC team pulled together some lessons and conducted two days of training for 12 Ukrainian officers and five US officers, who sat in on the training as well. Brown said the lessons included an introduction to space operations; basic orbital mechanics; satellite communications; positioning, timing and navigation fundamentals; navigational war fundamentals; and intelligence, surveillance, and reconnaissance fundamentals. Ullrich said the Ukrainians thought the training was very worthwhile and helpful. "They said they feel they can use the knowledge out in the field when they go fight the separatists. And they think every other unit should get the training when they rotate through," he said. According to Ullrich, there were also lessons learned from the experience. "The big thing is we probably got about as much from them as they got from us," Ullrich said.